Have you ever been frustrated by the fact that you can't see and use appointments information stored in your database while working in Outlook or Exchange? GeniusConnect turns Outlook into a more powerful information management tool through database connectivity! -Improved efficiency while working in Outlook through immediate access to current database information. -Easy access to calendar information, stored in your database. -Ability to quickly update and back-up information. -Offers complete flexibility by allow connectivity to any standard SQL Database. -Attachments support -Extract attachments to a folder -2 way sync GeniusConnect can be used with any relational database that supports ODBC (MS Access, mySQL, MS SQL Server, Oracle etc.) and with any database structure. A calendar folder can be linked to a database table or view. You can use your own table structure and define conversions for columns with data type's that are not compatible with an Outlook field. 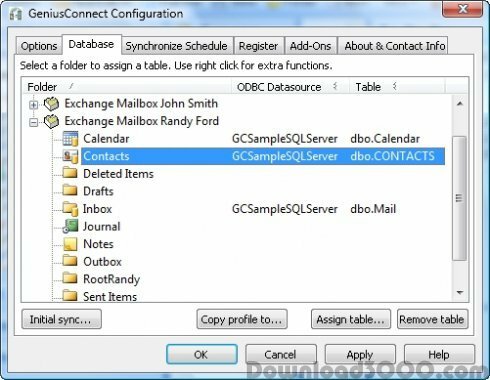 It is possible to use GeniusConnect on multiple Outlook or Exchange folders and multiple databases. GeniusConnect is an Outlook Add-On and becomes an integral part of Outlook after installation. GeniusConnect adds a new toolbar to Microsoft Outlook with buttons specific for synchronizing data and configuring GeniusConnect. Supports Microsoft Outlook 2002/2003/2007/2010/2013/2016.